MANILA, Philippines — Kyushu, Japan’s southwesternmost island, is known as the birthplace of the Shinto Sun goddess Amaterasu, from whom Japanese emperors were said to be directly descended from, and home to arguably the country’s friendliest and warmest people. 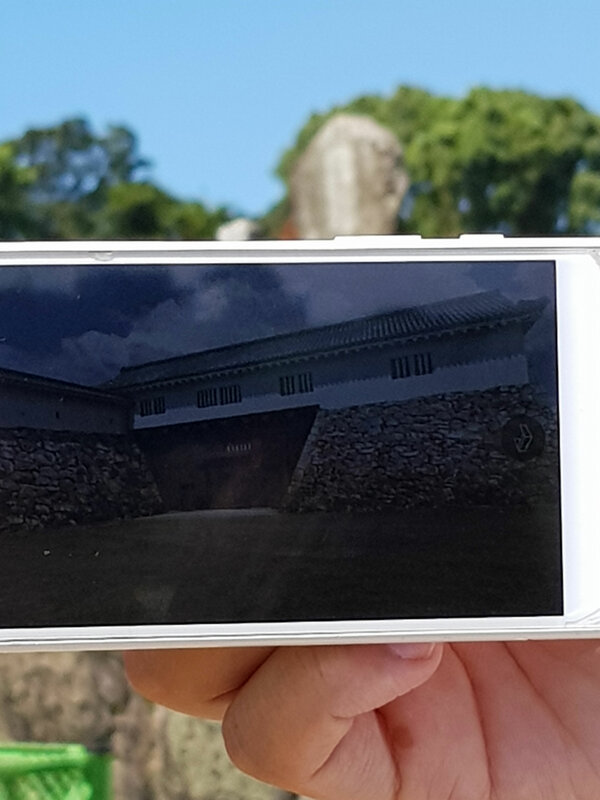 This second guide can be treated as a standalone tour itinerary or as a continuation of our first story on Nagasaki City and Saga for a seven day six nights Kyushu trip. Here are some things you can do and places to visit as you immerse yourself in Kyushu’s remarkable history and pristine nature. Get yourself a JR Kyushu Rail Pass (Northern Kyushu Area or All Kyushu Area) which can save you a lot as you travel around Kyushu. A five-day Northern Kyushu Area pass costs JPY 10,000 (around P4,766). It allows you unlimited rides for five days on major trains of JR Kyushu and seat reservations of up to 16 times. You can also score discounts on entrance fees of some tourist spots using your pass. You can expertly navigate Japan’s punctual train network by checking their routes and schedule on HyperDia. You can also download the NaviTime app on Android and iOS to check your transportation options and their first and last trips per day. Also, check opening and closing time of the sites you will be visiting. If you take the 9:45 a.m. flight from Manila, you will arrive at Fukuoka Airport by around 2:30 p.m. 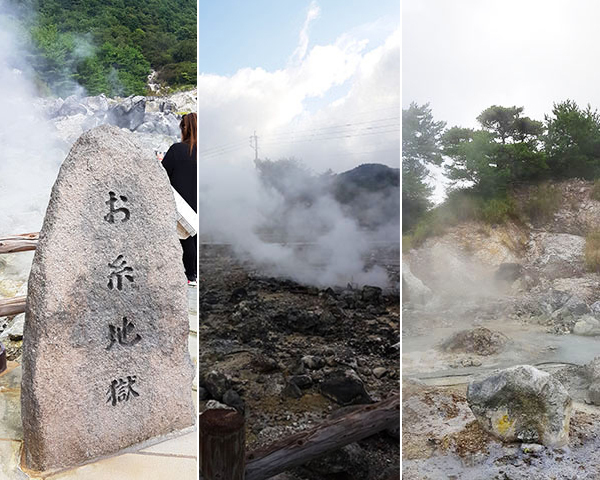 In the hot spring resort town of Unzen Onsen in Shimabara, Nagasaki is a distinctive terrain that is a hotspot of volcanic activity intimidatingly called Unzen Hell. Here, hot water and sulfuric gases spout out of the earth. 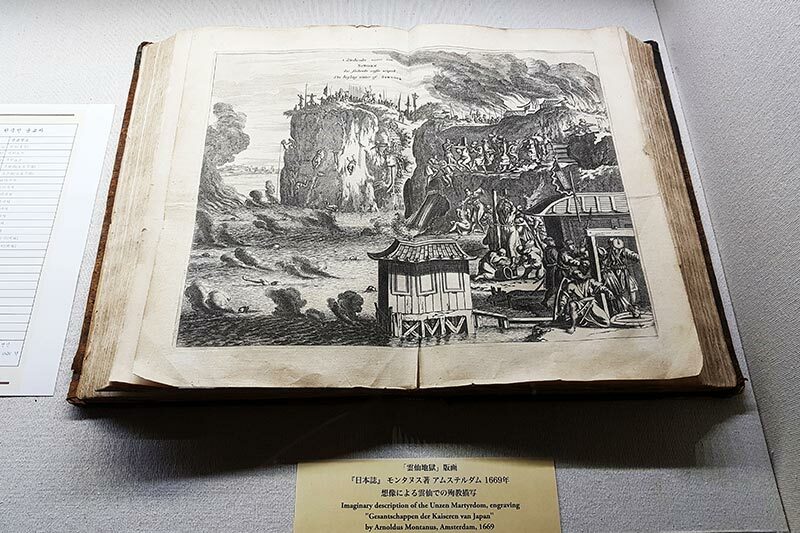 Historical records show many Christians were martyred in its boiling pools. Try visiting Unzen Hell at night for a different atmosphere. Although you can go there by yourself, the area is dark and it is advisable that you join the night guided tour that starts at 8:15 p.m. The tour costs JPY 500 (around P240). You can ask information about it from Unzen’s tourist association here. A depiction of how Catholics were martyred at the boiling pools of Unzen Hell. How to get there: If coming from Fukuoka Airport, take the Fukuoka City Subway Kuko Line to Hakata Station, which takes six minutes. Then transfer to the Limited Express Kamome to Isahaya Station which takes an hour and 44 minutes. From there, take the Shimatetsu Bus to Unzen Onsen which takes around an hour and 20 minutes. You can get a Shimatetsu One Day Pass for unlimited rides on Shimatetsu trains and buses for a day. It costs JPY 1,200 (P575). You can get the pass from the Isahaya Terminal Hotel (next to the Shimatetsu Bus Terminal). If coming from Nagasaki City, you can take the train from JR Nagasaki Station to JR Isahaya Station which takes around 30 minutes. From there, take the Shimatetsu Bus to Unzen Onsen which takes around an hour and 20 minutes. You can also take the Nagasaki Prefectural Bus near JR Nagasaki Station and get off Unzen Onsen. The ride will take around an hour and a half. 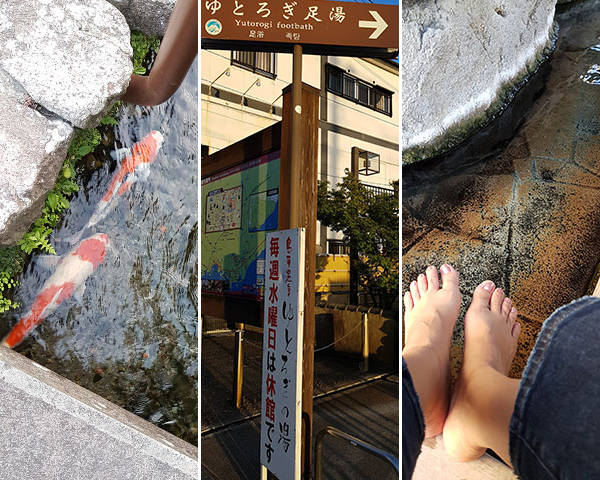 If you still have time to spare, you can also drop by the “City of Swimming Carp,” a street where carps swim freely in the network of canals. There are also open-air community hot springs in the area where you can dip your feet to relax. How to get there: The “City of Swimming Carp” is 10 minutes walk from Shimabara Station. Buses run from Unzen Hell to Shimabara. The ride takes less than an hour. The Nagasaki tourism site also has a variety of hotel recommendations you can choose from here. Among the budget options is the Shimabara Hotel Hakusan which is a three-minute walk from Minami Shimabara Station. The station is a less than five-minute train ride from Shimabara Station. Hara Castle became a grave site for around 37,000 peasants, mostly Christians, who were killed after a failed rebellion in 1637 over high taxation and religious persecution. Their revolt was led by young rebel leader Amakusa Shiro. You can take a VR tour of this UNESCO World Heritage site and see its original splendor. Just make sure that you download the StreetMuseum app on Android and iOS in advance. 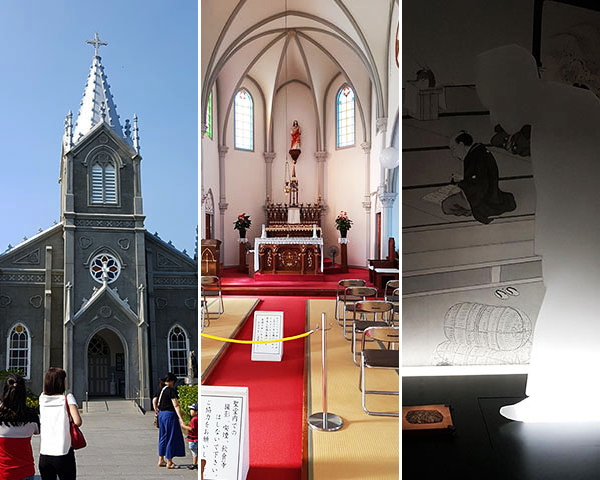 To get a picture of the 250 years of Christian history in Nagasaki, both the daunting and extraordinarily inspiring, make sure to visit the Arima Christian Heritage Memorial Hall. Know about the bloody rebellion, the sending of four young Japanese Catholics as ambassadors to Europe and how Western printing techniques made its way to the historic Shimabara peninsula. How to get there: You can take the bus headed to Kazusa Kaisuiyokujomae near Shimabara Station (one hour eight minutes bus ride) or Minami Shimabara Station (48 minutes bus ride). Get off at the Harajo-mae bus stop and from there walk for 12 minutes to Hara Castle Ruins. The Arima Christian Heritage Museum is a 20-minute walk in the opposite direction from the bus stop. If coming from Unzen Hell, you can take a bus to Shimabara Ekimae and, depending on the schedule, get off at the Shimabara-ko stop. There, take the bus headed to Kazusa Kaisuiyokujomae and get off at Harajo-mae bus stop. More than its internationally famous black bear mascot Kumamon, Kumamoto prefecture is also home to pristine nature, great seafood and rich history. 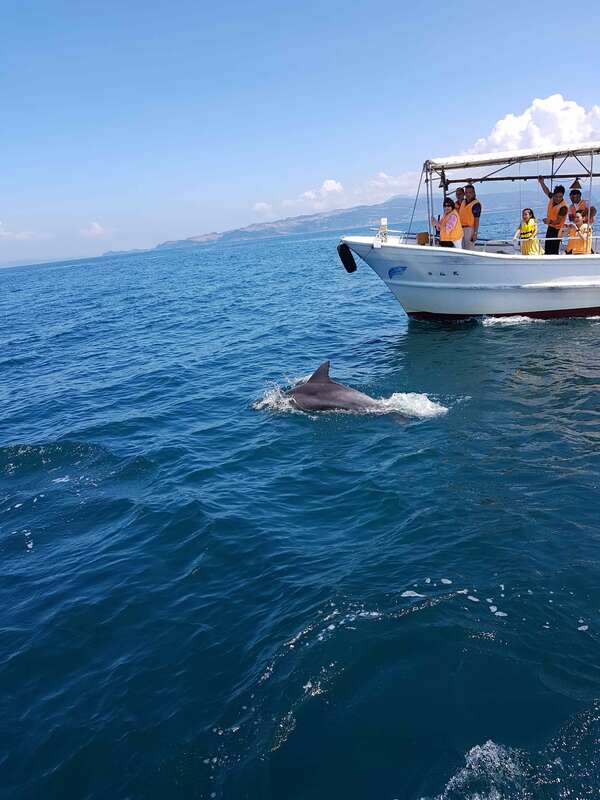 In the sea between Shimabara and Amakusa, you can join tours to see a pod of 300 wild dolphins for JPY 2,500 (around P1,195) at Iruka Marine World. You can grab a seafood barbecue lunch after at nearby restaurants. How to get there: Take a 30-minute ferry ride from the Kuchinotsu Port in Shimabara to Oniike Port in the town of Itsuwa. The fare costs JPY 360 (around P172). From Itsuwa it’s a 10-minute drive to Futae. Taxi information in Itsuwa is available on the website of the island’s tourism association here. Taxis are expensive in Japan and the ride from the port to Iruka Marine World can cost JPY 1,800 (around P860). 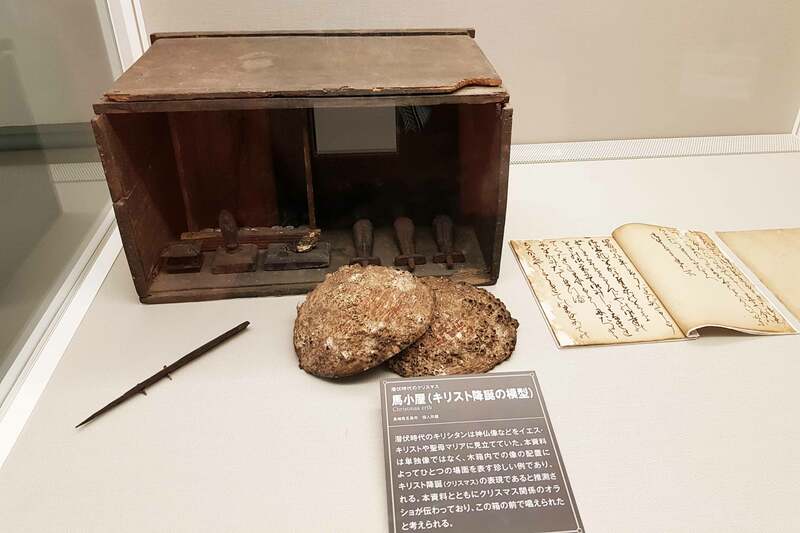 In the quiet fishing village of Sakitsu, a UNESCO World Heritage site, the sea is a daily part of life and with religious images inaccessible to them when Christianity was outlawed, they used shells and natural stones as objects of their Catholic devotion. A nativity scene whose Virgin Mary image is patterned to the Buddhist goddess Kannon and an abalone shell used as an object of devotion. During the years of persecution, the “Efumi” ceremony was held on the village headman’s house where people were asked to step on an image of Christ or the Virgin Mary to prove that they were not Christians. Now on that site stands the gothic-style Sakitsu Church fitted with tatami mats inside. On the way there, you can go to the water edge and enjoy the picturesque scenery facing Yokaku Bay. L-R: The gothic-style exterior of Sakitsu Church, its tatami mat-fitted interior and a depiction of the efumi ceremony. How to get there: Two minutes away from Iruka Marine World is the Kyu futae shogakko mae bus stop. From there, take a 31-minute bus ride to Hondo Bus Center. Head to Platform Number 2 and depending on the available buses, you can take the one headed to Shimoda Onsen bus stop which takes 43 minutes. There take another 44-minute bus ride to Sakitsu Kyokai Iriguchi bus stop. The stop is a one-minute stroll away from Sakitsu Church. For budget and luxury hotel recommendations and a sample Kumamoto tour itinerary, you can get in touch with their friendly tourism office staff here. If you want a room with view of the magnificent sea, you can stay at Oyano Yanagiko Onsen Komatsuya Nagisakan, which is a two hours and five minutes bus ride from Oniike Port and two hours and 11 minutes from Iruka Marine World. One of Japan’s three most famous castles—along with Himeji Castle in Hyogo and Matsumoto Castle in Nagano—Kumamoto Castle was built by master tactician Lord Kato Kiyomasa to withstand the toughest siege conditions. 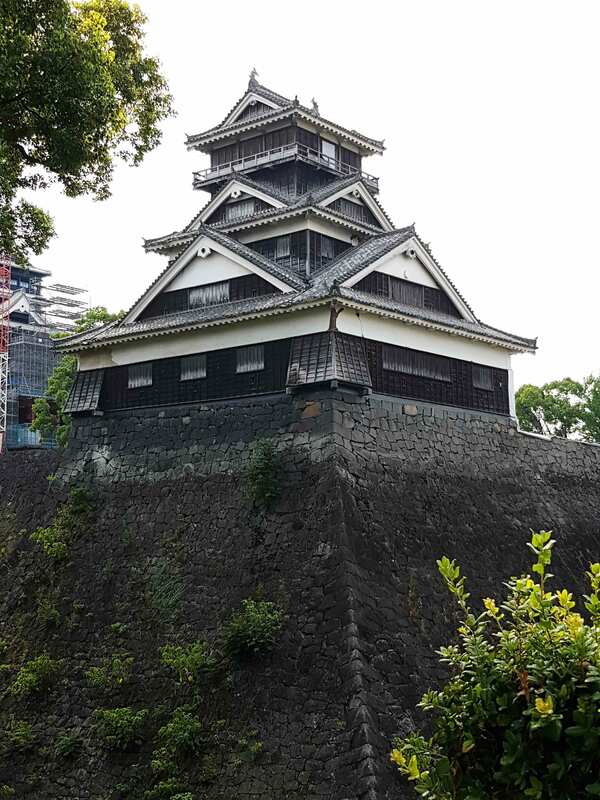 The steeply curved slope of its walls make it difficult for a samurai to climb up and long metal skewers protruding from the top served as its ninja defense. It is the site of the 1877 Satsuma rebellion led by one of Japan’s most influential samurais Saigo Takamori, the model for the Hollywood film “The Last Samurai.” Sadly, it’s closed for restoration after sustaining heavy damage due to a 7.3 magnitude quake in 2016. But you can still admire its beauty from the castle complex grounds. 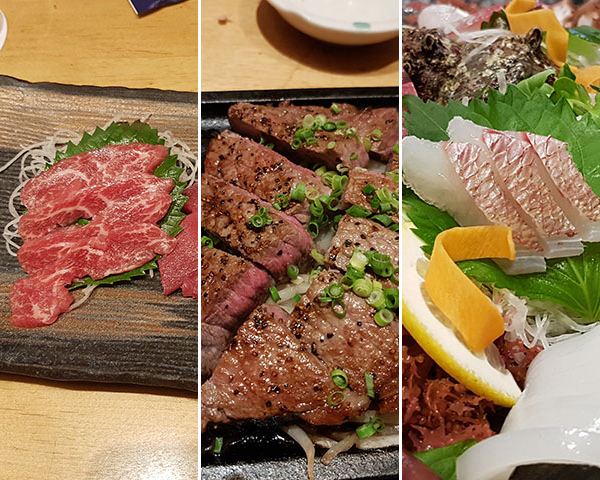 For lunch, you can have delicious horse meat sashimi, a popular dish in Kumamoto, before heading to Hakata in Fukuoka. How to get there: Kumamoto Castle is located northeast of JR Kumamoto Station. Take a tram from JR Kumamoto Station and alight at the Kumamotojo-mae stop. You can also take a bus headed to Kumamoto Kotsu Center which is a 15-minute walk from the castle. Once you’ve settled in your hotel, you can stroll around the major shopping complex of Canal City near Hakata Station, have a dinner of skewers at Yatai food stalls that dot the city’s tourist areas or Fukuoka’s iconic Motsunabe or Mizutaki hotpots, or head to Dazaifu Tenmangu Shrine and try out Shinto rituals. You can also walk around the shops that line the route to the shrine and try local delicacies like mentaiko or marinated cod roe. You can also rent a kimono for two hours for JPY 3,500 (around P1,675) and take photos wearing the traditional garb as you go around the area. Another option is to head to the Tenjin Underground Shopping Mall which is connected to the Tenjin and Tenjin-Minami subway stations, less than 10 minutes ride from Hakata Station. How to get there: Take a bus from the Kumamoto Kotsu Center bus stop headed to Fukuoka and get off the Hakata Bus Terminal near the Hakata Station. The bus ride takes two hours and eight minutes, and costs JPY 2,060 (around P986). To get to Dazaifu Tenmangu Shrine, take a bus headed to Nishitetsu Dazaifu Station and get off at the Dazaifu bus stop. The ride costs JPY 600 (around P287) and takes 40 minutes. You can also take the JR Kagoshima Line Rapid from Hakata Station for a 15-minute ride to Futsukaichi Station. From here, walk for 16 minutes to Nishitetsufutsukaichi Station and take the Nishitetsu Dazaifu Line to Dazaifu Station. The ride takes five minutes. 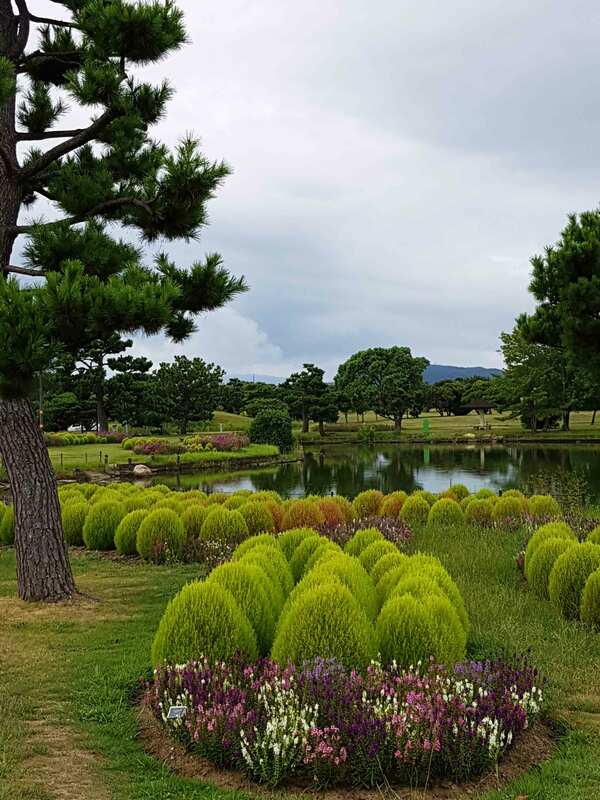 On the day of your flight back home, stop by Uminonakamichi Park for a relaxing stroll of picture-perfect scenery. Upon entry, a Japanese pond surrounded by bright seasonal flowers will greet you. An amusement park and a petting zoo can also be found inside. Entrance to the park costs JPY 450 (around P215). The aquarium attraction of Marine World Uminonakamichi is also nearby. Entrance there costs JPY 2,300 (around P1,101). How to get there: Take the JR Kagoshima Line from Hakata Station to Kashii Station which is a 10-minute ride. Transfer to the JR Kashii Line for a 20-minute ride to Uminonakamichi Station which is just outside the entrance to the park. The trip costs JPY 460 (around P220). 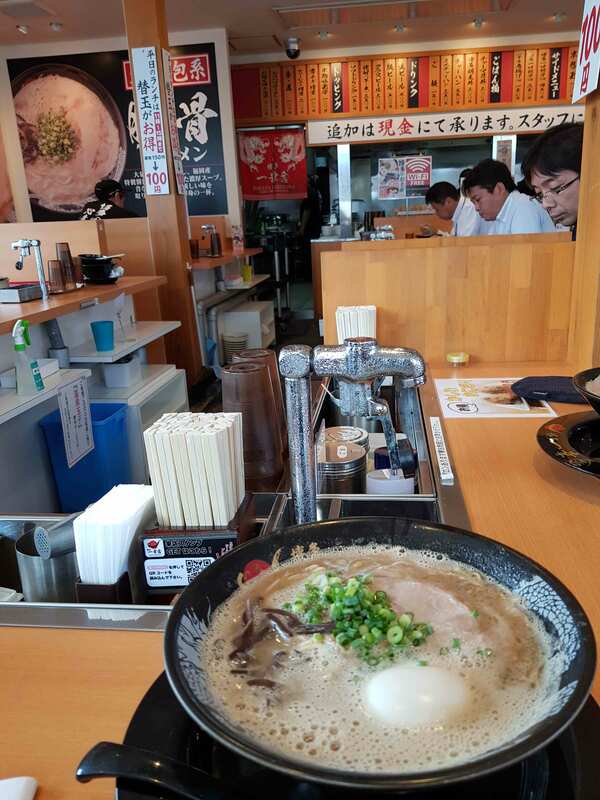 After enjoying the park, head back to Hakata Station and enjoy a lunch of Hakata Ramen before heading to the airport for your afternoon flight. Take the Fukuoka City Subway Kuko Line from Hakata Station to Fukuoka Airport. The ride takes five minutes and costs JPY 260 (around P124). Editor’s note: The trip to Kyushu was hosted by Media International Co., Ltd. to promote tourism. At no stage does the host have a say on the stories generated from the coverage, interviews conducted, publication date and story treatment. Content is produced solely by Philstar.com following editorial guidelines. The itinerary above is a model you can pattern your trip on. You can choose to adjust your tour depending on your schedule. The itineraries are based on 8 a.m. checkouts at hotels. Room fees are computed based on a two-person per room occupancy. Some hotels charge the rooms on a per head basis.